Another of my "signature" wedding images. Hey...I’m not taking creative credit for this. 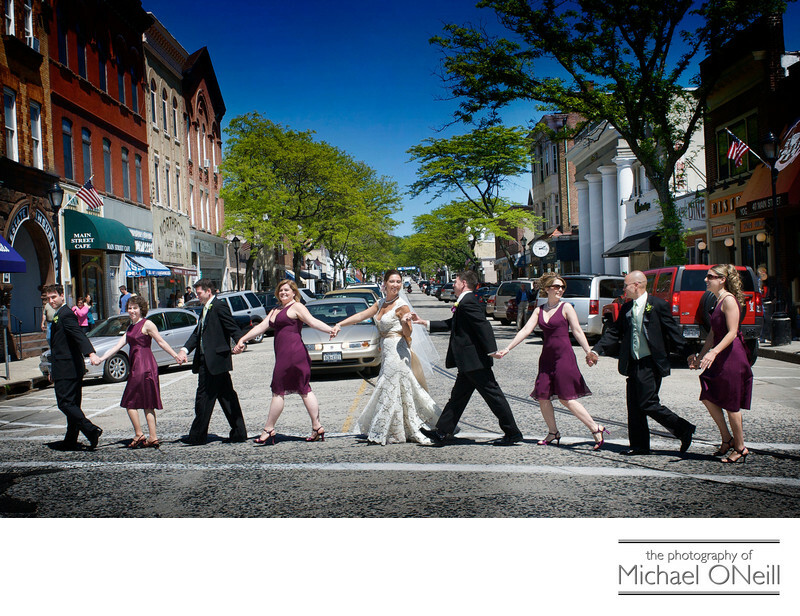 It is obviously a take off of the famous Beatles "Abbey Road" album cover. But it is special to me in so many other ways. For starters it is taken at the foot of Main Street in Northport, NY...a village I have called "Home" since 1978. Secondly, it is a picture of the bridal party of one of the most amazing couples I’ve ever had the pleasure of working with. Allison and Phil planned one of the most incredible wedding experiences I’ve ever been a part of. They are true wine connoisseurs and planned their entire wedding theme around the wineries and vineyards of the north fork of Long Island, New York. Before the wedding we enjoyed an engagement session that included locations at some of the most prominent Long Island Vineyards: Bedell Cellars, Macari Vineyards, Martha Clara Vineyard, Raphael and Pindar. Their wedding reception was hosted at Giorgios in Baiting Hollow, New York; a wonderful catering establishment that has it’s own vineyard on the grounds. Long after their awesome wedding I have stayed in touch with this couple. I have documented the start of a family of their own with maternity pictures prior to the arrival of their first born, Michaela...as well as a photographic documentary of Michaela’s first year on this planet. When it was time for Phil’s brother to marry a few years later there was no question as to who would be their wedding photographer. When most businesses lose sight of their past clients over time, every year I feel closer and closer to this family. That is one of the greatest rewards of being a wedding and family photographer.